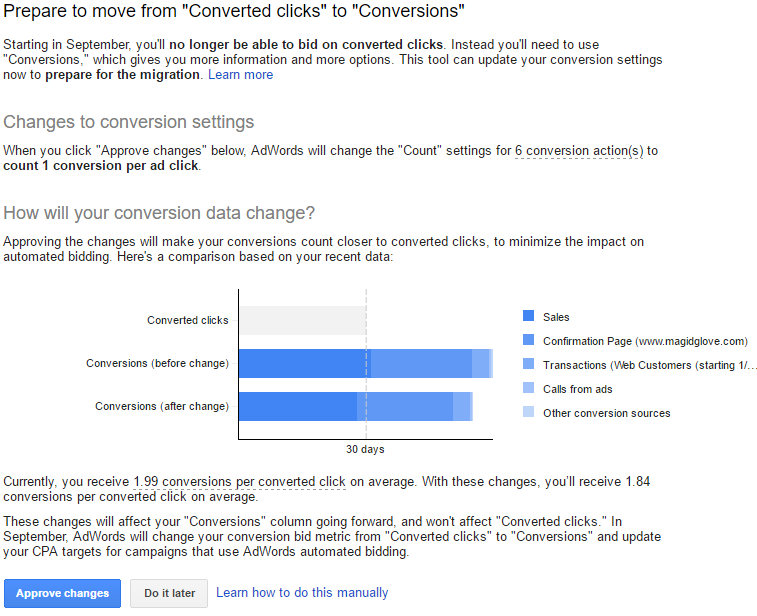 AdWords will soon be doing away with the “converted clicks” metric. It will no longer show up in your reports, it will no longer be used in self-optimizing automated bidding strategies. In this post, we’ll explain why this change is being made, what the difference is between converted clicks and conversions, and what you should do to ensure accurate reporting going forward. What is a converted click and how is it different from a conversion? A converted click is not a conversion metric, it’s a click metric. Converted clicks represent when an ad click results in one or more conversions. So, let’s say User A clicks an ad, makes a purchase, signs up for a newsletter and requests a quote. All that activity registers as a single converted click. Let’s say User B clicks an ad and signs up for a newsletter—that too registers as a single converted click. User A converted three separate times (purchase, newsletter, quote), while User B converted just once (newsletter). That’s the difference between converted clicks and conversions, and that’s why you’ll often see fewer converted clicks for a campaign than total conversions. The chart below illustrates how AdWords reports converted clicks versus conversions. In the case of this advertiser, the number of conversions is much higher than converted clicks, because the advertiser tracks multiple goals and types of conversions. Based on the chart, they are tracking Sales, Transactions, users landing on a Confirmation Page and calls from ads. If you look at the grey bar, Converted clicks have been doing a good job of aggregating results while the blue bars tell you a much different story. If you’ve been using converted clicks, the way you measure success is about to change. Now that the conversion tracking tool in AdWords has become more sophisticated—adding new types of conversions it can track—its capabilities overshadow the converted clicks metric enough to make converted clicks expendable. Going forward, you’ll be relying more than ever on the conversion tracking tool to illuminate your progress. Because Google’s automated bidding systems use conversion data to self-optimize, it’s important to feed the algorithms accurate information. For advertisers using Enhanced CPC or another automated bidding strategy, converted clicks will no longer be a factor. To do accommodate this change, you’ll want to make a few adjustments to your conversion count settings. If you’re tracking online sales, “every“ is likely your best choice, since each purchase adds value to your business. And if you’re tracking leads (form submissions, phone calls, etc. ), “one” is likely the better choice since getting two leads from the same user is not going to mean the same for your business as getting two leads from two different users. Go to the Tools menu and click Conversions. Depending on your settings, you may see the following box in the upper right hand corner of your page. Click the box and follow the prompts to have AdWords make the transition for you. If you don’t see the box below, there is no action required. AdWords will show an estimation of how the removal of converted clicks will affect your conversion reports, and the platform will then explain it may take up to two weeks to allow the automated bidding algorithms to adapt to the change. A word of warning before you click “Approve Changes”: It’s important to be aware of the changes AdWords is proposing. In this example, AdWords explains it’s going to change the count of (6) conversion actions to a count of (1) conversion per ad click. Since one of the conversions being tracked in this example is online sales, or transactions, setting the conversion count to one will not fully report the value of those six conversion actions. If this business was using an automated bidding strategy, online purchases would be excluded from the automated bidding algorithm. Therefore, the changes need to be made manually. Review your site and figure out which conversions have diminishing value if they come from one user, and which conversions have equal value regardless of the initiating user. Set proper conversion counts to help keep your conversion bid metrics and reporting accurate. We recommend making a note of when this change was made so you can account for any changes in your future reporting. Download historical converted clicks data before Google removes them. Change your reporting columns by activating the new conversions column, if you’re not already using it. We tend to question Google’s motivation behind major changes, and in this case it’s peculiar that the update isn’t getting a lot of attention. It seems most of the people discussing this change are operating under the assumption that the average AdWords user is familiar with the subtleties of AdWords conversion tracking. For those who aren’t so familiar with the subtleties, we want to help clear things up and ensure future success. If this post has raised any additional questions for you, don’t hesitate to reach out to us for further input!